Meatwad was also good in the episode where he starts predicting stuff. "Do not drink the mlk. Do not drink the milk!" My favorite episode is "Revenge of the Trees". That flash-fried cheese-filled cow would probably taste awesome. Youre not the only one Delerak, or w/e... I seem to read it as shakes voice in my head too! Must be the picture, maybe some kind of mind control in it? Yeah, I have the same problem when a guy on a forum uses a girl for his avatar. I always feel like I'm talking to a girl. How can they blame me if I mistake them for a girl? If somebody walked up to me and LOOKED EXACTLY LIKE A GIRL, I'd PROBABLY think it was a girl. Maybe it's because the avatar is your only visual representation on a forum. If you see the pictures I use for my personal photos in my profile, you'll probably think I'm Bigfoot, or like my old one: a homicidal hunk of cheese. Or an alien autopsy (that one's still in the works). It may even be just a normal alien, not getting dissected, and it may be in a few minutes or something. 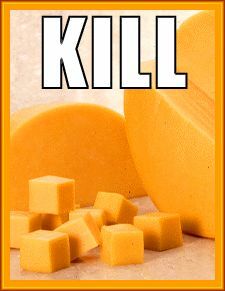 A homicidal huk of cheese? I want that picture. But I also have alot that I want to use for my avatar as well. I still haven't decided. Also, have you ever thought of flash frying a cow? The batter would taste awesome. That's what I had for my old personal pic. Before bigfoot and the current alien, that is.